We’ve been working with people with dementia through 2018 to develop new symbols that are easier for people to understand. At the end of the year we conducted an online survey to find out what people thought about the symbols before we went on to the next stage of development. We also conducted research with 590 great kids from Exwick Heights Primary School. We’ve written a brief interim report to let people know what we found out from those 2 pieces of work. 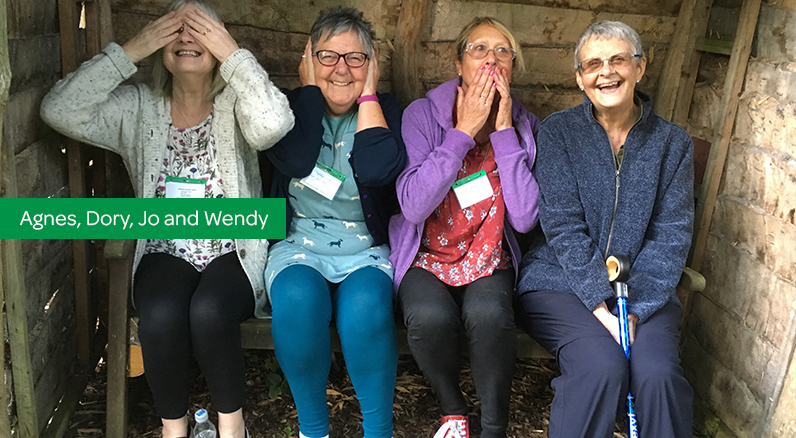 For the past 4 years we have been working with a PPI group of people with dementia and carers – called the ALWAYS group (Action on Living Well: Asking You), as part of the IDEAL research programme http://www.idealproject.org.uk PPI is a term that is used a lot in research. It stands for Patient and Public Involvement. In the article we discuss some of the practicalities that can make PPI a better experience – for people with dementia and for researchers. Finally you may want to read a blog we have written: http://blogs.exeter.ac.uk/dementia/2018/10/29/reflecting-on-ppi/ or even watch our film below! New review of the evidence for dementia friendly communities published. In 2017 we worked with Imogen Blood Associates on a review of the evidence for dementia friendly communities. This was part of the EU Joint Action on Dementia looking specifically at dementia friendly communities. Our research involved a review of 82 articles and reports. We also held three discussion groups with people with dementia, including 2 DEEP groups and the European Working Group of People with Dementia. We conducted 20 interviews with people involved in dementia friendly countries in 10 countries, mostly in the EU but also in Australia. On the same page you can also see a video about the report, presented by Imogen to the Alzheimers Europe Conference in 2017 here. Here’s a press release from the Big Lottery Fund about an exciting new development that will keep people with dementia at the heart and start of research. The aim of the workshops was to gather these perspectives and share them as part of the opening plenary for the 2017 UK Dementia Congress in Doncaster. A main theme of this conference was around end of life issues for people with dementia and carers and particularly post bereavement support. From these workshops we have produced this report, that aims to shift end of life conversations from difficult to important. Click here to download the report. For the last 3 years we have partnered with the Research Institute for Disabled Consumers (RiDC) in a series of consumer testing projects around the UK. Over that time groups in the DEEP network were invited to think about local services, products or organisations that might want to become more accessible to consumers with a dementia. A full report of each of the projects carried out across the country is available on a dedicated page on the RiDC website http://www.ridc.org.uk/content/dementia-research/ but here’s a flavour of several of the local projects. DEEP group members in Rochester did some mystery shopping at the Huguenot museum in Kent, advising on clarity of audio and visual information. We went to the Bingo in York (advising on pace of games, orientation and language) and the Royal Shakespeare company in Stratford, advising on signage, performance and facilities. We tested out taxis in Camden, (making recommendations on awareness and identification), the ‘Next Stop Announcement’ system on the buses in Leeds (informing on the design and display of information) and tested out the accessibility in a major bus centre and rail complex in Belfast, advising on signage, information and ticket purchases. And we threw ourselves into testing the process and accessibility of obtaining financial lasting powers of attorney in West Berkshire, recommending training and calling for a less stigmatised approach to the process. As well as providing key recommendations for those organisations tested, DEEP members found the experience very positive and it gave great confidence for groups to offer further work locally, which they continue to do. The All-Party Parliamentary Group on Dementia is currently consulting on ‘dementia and disability’. iD have submitted our response which you can find here. In this masterclass, Rachael Litherland from Innovations in Dementia is joined by Keith Oliver, a member of the IDEAL study public and patient involvement (PPI) group ALWAYs, Dr Catherine Quinn from the University of Exeter and Dr Alex Hillman from Cardiff University to discuss PPI in research. They reflect on the value of PPI in research from the perspective of both advisory group members and the researcher. The masterclass contains recommendations for good practice when planning or using PPI in research. Innovations in Dementia monthly newsletter. April 2018. Where has Brain Waves been? What will happen with news from now on? Click here for a pdf of the newsletter.